Hercules, the specialist in digital DJing solutions, announces the immediate availability of the newest version of their DJ Console line, the DJ Console Mk4, a mixing console with a compact design and analog audio source connectivity. This new mixer for amateur to mobile DJ’s is an updated version of their earlier, top-selling models worldwide, the DJ Console and DJ Console Mk2 and features a multitude of improvements and additions that will facilitate musical creativity. Featuring a cutting-edge design, this portable controller includes 2 decks and a high-performance audio interface, making it a real, all-in-one DJ station for PC and Mac users. Built for mobile DJing, the DJ Console Mk4 features a strikingly modern design with a thinner but wider body than the previous model, the DJ Console Mk2. The metallic-colored surface top with a see-through plate and new body provides a comfortable mixing solution to any DJ. It also includes more precise jog wheels, 4 browser buttons instead of a joystick, more space between the cross fader and jog wheels and backlit buttons for ease of use during low-light conditions. 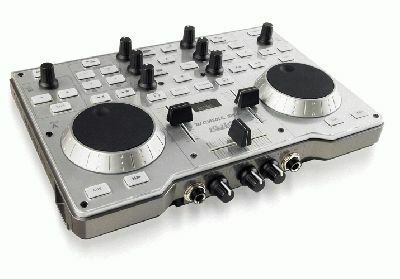 Compact (7.36” x 10.4” x 2.5”) and lighter than a laptop computer (2.5lb) with large, non-slip feet for perfect stability while mixing, users can take the Hercules DJ Console Mk4 anywhere.